FYI: I had my baby one day after my last post (good thing I got Lady Friday done!) and haven't been able to read a thing since. Well, I did read the last Harry Potter but nobody needs me to blog about that. I'm back at work, albeit very part-time and no longer as a YA Librarian, but I hope to get some reading and blogging done. Eventually. I did not want to read this book. This might be surprising to those of you who have read my love letters reviews of the rest of the series (Mister Monday; Grim Tuesday; Drowned Wednesday; Sir Thursday ). Of course I *wanted* to read the book. I just didn't want to read it now--I thought I would read it while in labor and it would get me through it because I love this series so much. And then I started thinking what if I start it and then labor is really quick and I don't finish it and you know I'm not going to have the time once baby #2 is born. And that would be horrible! So I had to read it right away. I'm going to spare you the summary of the series. Partly because you should just read the former reviews and partly because I'm not in the mood for intelligent coherent sentences. 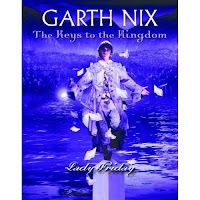 In Lady Friday, the fifth book of the series, Arthur must find the 5th key and the 5th part of the will. Lady Friday has given him, the Piper and Superior Saturday the chance to find the 5th key by abdicating her control. Of course Arthur smells a rat and doesn't trust her "abdication." He decides to look for the will first and use the will to help him locate the key. Along the way he meets up with his old friends Suzy Turquoise Blue and Fred Initial Numbers Gold. Once again Arthur's story is alternated with Leaf's. After defeating the spirit-eater from Sir Thursday she is hospitalized on Earth. Unfortunately for her the hospital is run by "Dr. Friday." Leaf is kidnapped by Dr. Lady Friday and transferred to one of the second realms. She learns of Lady Friday's unusual addiction and tries to battle her and get in touch with Arthur. Fans of the series will not be disappointed in this latest installment. We know by now that of course Arthur will find the will and the key. He is the rightful heir. But will he use the keys? Will he sacrifice his humanity to save his Denizen friends? How far will he go to do the right thing? In my last review (of Sir Thursday) I mentioned the previous trustees as having characteristics of the 7 deadly sins. Mister Monday--Sloth; Grim Tuesday--Avarice; Drowned Wednesday--Gluttony. I think those are the only ones that are really clear-cut. I'm not sure where Sir Thursday fits in. We've got Lust, Wrath, Envy and Pride left. Sir Thursday could fit Wrath--he did command an army. Lady Friday could fit Lust if you expand the definition to more than just sexual lust. She could also fit Envy--she was jealous of humans and their ability to sleep and dream and be mortal. I'm curious to see if I'm the only one who can see the connection... anyone else out there have any ideas? Edited 5/14 3:3o pm: Ha! So I'm not reading too much into it! According to wikipedia (which we all know is the source of all knowledge), Lady Friday is afflicted with Lust. Ha ha! And yes, Sir Thursday is wrath. I didn't read any of this before I wrote my reviews. So of course now I'm wondering if the entire world is so much smarter than me. Sigh. Disturbing. Freaky. Yet riveting. I know there's been a lot of mixed reviews of this book--some people love it, some people hate it. I suspect the people who hate it just can't get over the freakiness of it. Ivy is 7 years old when she stumbles across the taxidermied-body of her neighbor's mother. Although she screams and is freaked out, she is also strangely fascinated by her neighbor's (71 year old twins Dolph and Ab) activities. She realizes that she too loves her mother as much as the twins' loved theirs and embarks on an apprenticeship with them learning all there is to know about taxidermy. I finished Love Curse in a day. It's not a very long book and it's pretty hard to put down once you start reading. It's just so... odd. Much like the twins themselves. Half of the story takes place when Ivy is 7 and just learning the secrets of the twins and the other half happens when she is 16 and learns the secrets of her own history. The story is gripping and interesting and definitely leaves the reader with something to think about. Is it possible to love your mother *too* much? Teens who like mind-blowing books and books that make one think "What the hell??" will be drawn to this one. This was probably not the best time for me to read this book, but I knew there was a request list for it and I felt guilty so I got it done. The meteor. Suddenly the moon was closer to Earth than it should have been. It's easy to forget how important the moon is--but with it being out of whack the tides were also out of whack, causing huge tsunamis, tornadoes, volcanoes, earthquakes and all sorts of natural disasters. Floods wiped out whole states and countries, killed millions of people and left others with no food, oil, or electricity. Miranda is one of the lucky ones since her mom freaked out at the beginning and used all her money to stock the house with boxed and canned food. But their food and their luck can't last forever. Written in journal format, Miranda's story is gripping and heart-breaking. She is a likeable sympathetic character who sacrifices everything to help her family. There was one point that kept bugging me--they had food but no electricity so how were they cooking? It was finally explained that the stove was natural gas and didn't rely on electricity so they were fine cooking. Until the gas ran out. Although it was eventually explained this bugged me because I automatically think of not being able to cook when the electricity is off. Other than that very very minor point, this is a good solid read and highly recommended. John Green's follow up to his award winning first novel Looking for Alaska is just as entertaining and well-written, although not as heartbreaking. Colin Singleton has made a habit out of only dating (and getting dumped by) girls named Katherine. When Katherine 19 breaks up with him he and his best friend Hassan embark on a road trip to nowhere to break Colin's depression. Colin, who happens to be a child prodigy hoping to one day be a genius, decides to find a formula based on his history with Katherines that would predict the outcome of all romantic relationships. The two get sidetracked in a small town in Tennessee and Colin discovers much more than a formula. Although Colin is a bit whiny and tends to drive people (Katherines) away with his constant need of approval and his low self-esteem, he is at heart a likable character. The friendship between him and Hassan is realistically portrayed and entertaining. Hassan is the comedic relief who slaps some sense into Colin. In Tennessee they meet up with Lindsey who also brings Colin back to reality. Green includes footnotes throughout the story, especially when Hassan tells Colin that some piece of knowledge he is about to impart is not interesting, allowing readers to judge for themselves. As a geek, I found the footnotes very interesting. There's also an appendix explaining the math used in the formula. I haven't gotten around to reading that yet but I intend to. While this is by no means a fluffy feel good novel, it is not as emotionally heartbreaking or significant as Alaska. It is a bit lighter, with funnier moments, and a less intense plot. It is definitely an enjoyable read and highly recommended. I think it would suit high schoolers more since they tend to have more of a romantic life-history and the angst that goes along with graduating from high school and not knowing what's going on in your life. This is the 3rd book in this series and just as funny as the first two. Jess Jordan really knows how to get herself in trouble--after spending the summer worrying about her boyfriend cheating on her because of some miscommunication, she lets yet another miscommunication break them up the day before school is to begin. From there her school year just gets worse and worse. Jess is a funny likeable character. Girls who liked the Louise Rennison books will be attracted to all of Jess's mishaps and her Britishisms but will like Jess even more because she's not as mean-spirited as Georgia Nicholson is. Jess is just a confused teenage girl with delicate self esteem who would like the world to revolve around her but knows it doesn't. I heartily recommend this entire series to middle and high school girls alike. Boys probably won't be as interested. I read Stuck in Neutral many years ago, but just re-read it for my middle school book group. I remember the book having a big impact on me the first time I read it, but reading it while being pregnant was even more of an emotional experience. I continued on with Cruise Control hoping I would get some sort of closure. Cruise Control is set in the same time period at Stuck in Neutral but it's told from older brother Paul's point of view. Some of the events from SIN are mirrored in CC and it gives a more complete picture of the McDaniel family home life. Paul is a loving brother, even if he can't express it, and his difficulties of being a sibling to a "vegetable" are realistically portrayed. This is NOT a sequel. It's not necessary to have read SIN first, but the experience of reading CC is so much more complete and meaningful when you have read SIN. I was hoping for closure--for some clue as to what the father was going to do with Shawn (the developmentally disabled "vegetable") but Trueman doesn't give it up. Once again the ending can be interpreted in more than one way. People who are more positive are given a glimmer of hope that maybe Shawn and Paul's Dad will be interrupted and rethink his plan (to end his child's suffering). Those who aren't quite so positive can see it the opposite way--that Paul will be too late. CC is not quite as strong as SIN but that's just because it's told from a different point of view. I shouldn't say it's not as strong. It's not as painfully moving as SIN was, but it's still a great book.